The Vedas are a vast subject; the topics they cover include all manner of knowledge regarding every facet of civilized human endeavor. The Sanskrit word Veda itself means "knowledge," yet the knowledge they profess to deliver is of a different nature than most of what passes for such today. Readings in Vedic Literature reminds us that there's a difference between conclusive knowledge and information collection; applied knowledge leads to a higher quality of life, while information collection does not. Scholars may (and often do) disagree on this or that technicality regarding the validity, accuracy, origin, and definition of the Vedas, but Krishna Himself makes it clear what their ultimate purpose is in the Bhagavad-gita: vedais ca sarvair aham eva vedyo, "by all the Vedas, I am to be known." Readings in Vedic Literature has become a standard text in universities for its clear and balanced presentation of the purpose and history of the Vedas. It presents the views of Vedic and non-Vedic scholars while making the overall point that, since Krishna is the ultimate end of all knowledge, the Vedic tradition is alive as long as there are devotees of Krishna in the world. Chapter 1: What Are the Vedas? 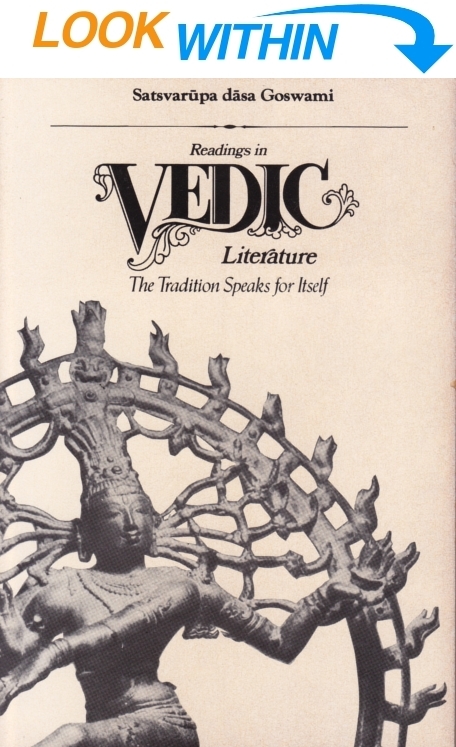 “The Rig Veda, Yajur Veda, Sama Veda, Atharva Veda, Mahabharata [which includes the Bhagavad-gita], Pancharatra, and the original Ramayana are all considered Vedic literature.… The Vaishnava supplements, the Puranas, are also Vedic literature.” We may also include corollary literatures like the Samhitas, as well as the commentaries of the great teachers who have guided the course of Vedic thought for centuries. In any case, to be accepted as Vedic, a literature must maintain the same purpose as the original Vedic texts. The Vedic scriptures (shastras) comprise a harmonious whole with a harmonious conclusion (siddhanta). Consequently, we may accept as a bona fide Vedic writing any work that expands on the Vedic siddhanta without changing its meaning, even if the work is not one of the original scriptures. In fact, the Vedic tradition necessitates further authoritative works that convey the Vedic message according to time and place. However, to be genuine, these extensions of Vedic literature must strictly conform to the doctrines of the Vedas, the Puranas, and the Vedanta-sutra. Vedic literature is neither dead nor archaic. Nevertheless, any literature—be it ancient or modern—must be considered non-Vedic if it deviates from the Vedic siddhanta. Thus Buddhism, Jainism, and Sikhism, though definitely outgrowths of Vedic literature, are not considered Vedic. Even the conception of Hinduism is alien to the Vedic conclusion, as we shall see later. The Vedic scriptures are vast in scope. The Rig Veda alone contains 1,017 hymns, the Mahabharata consists of 110,000 couplets, and the eighteen chief Puranas contain hundreds of thousands of verses. We may ask, “Why do these writings exist? Where did they come from? Who wrote them?” The present book searches out the answers to our questions in the Vedic shastras themselves. As its main purpose, the Vedic literature imparts knowledge of self-realization and, therefore, liberation (moksha) from suffering. Generally, scholars agree that the goal of Indian thought is to attain the truth, “the recognition of which leads to freedom.” “Every Indian system seeks truth, not as academic, ‘knowledge for its own sake,’ but to learn the truth which shall make all men free.” Indeed, Indian thought strives not for information but for transformation. Bhagavad-gita describes knowledge as “accepting the importance of self-realization, and philosophical search for the Absolute Truth.” Yet if people think they are progressing on the path of material happiness, they will not seek to transform themselves. Hence, another important realization—janma-mrityu-jara-vyadhi-duhkha-doshanudarshanam: “perception of the evil of birth, death, old age, and disease” (Bhagavad-gita 13.9). Uncompromisingly, the Vedic literature asserts that despite its apparent joys, material life means suffering. Vedic knowledge purports to free the sincere inquirer from that suffering. According to Bhagavad-gita (Bg. 8.16), “From the highest planet in the material world down to the lowest, all are places of misery wherein repeated birth and death take place.” Apart from the repeated miseries of birth, old age, disease, and death, the Vedic writings describe another threefold set of miseries: miseries arising from the body itself, miseries inflicted by other living entities, and miseries arising from natural disturbances (such as severe cold, heat, flood, earthquake, or drought). Vedic teachers argue that even if these latter miseries were absent, no one could find happiness in the material world—the forces of time and death force everyone to leave his position. Indeed, the Sanskrit description of the earth is Mrityuloka, place of death. It is also duhkhalayam (a place of miseries) and ashashvatam (temporary) (Bg. 8.15). On hearing this sweeping analysis of life in the material world, Albert Schweitzer termed the Vedic philosophy “world– and life-negation.” Others have stated that the Vedas teach pessimism and fatalistic resignation. But when we view the Vedas closely, we can discern that they teach quite the opposite; they propose that the purpose of human life is not to resign oneself to a temporary and miserable world, but to strive for permanent happiness. For people who follow the Vedic formula, life means an opportunity to attain victory over death. In the Vedic conception, a person negates life precisely when he identifies the illusory body with the self and considers the temporary world to be all-in-all. Such a person misses the opportunity afforded a human being—the opportunity to inquire about the Supreme. We can see in the Vedic verses an inexorable link between the substance of Vedic knowledge and the means for receiving it (between the Vedic message, we could say, and the Vedic medium). In contrast with Western conceptions, Vedic epistemology favors the process called shabda (hearing from Vedic literature), out of three possible knowledge-gaining processes. The first process, pratyaksha (empiric sensual perception), depends on correction from outside sources. For example, to our eyes the sun may seem no larger than a coin, but from scientific calculation we learn that our senses mislead us—the sun is many times larger than the earth. The second knowledge-gaining process, anumana (theories based on evidence), cannot give knowledge of what is beyond the range of proof. Charles Darwin’s theories and much of archaeology and anthropology rely upon such inductive conjecture (“It may have been like this, or perhaps it was like this”). According to the Vedas, anumana cannot independently lead to perfect knowledge. The Vedas assert that objects beyond material nature cannot be known experimentally. These objects are therefore called achintya. That which is achintya cannot be known by speculation or by argument but only by shabda, the process of hearing from Vedic literature. Indeed, shabda, the third knowledge-acquiring process, is considered the most reliable and important. For, since human beings are limited and imperfect, their perception, theories, and speculations cannot be perfect. With the exclusion of shabda, the Vedas estimate all knowledge to be defective in four ways. First, regardless how bright or precise a person may be, the Vedas affirm that he cannot escape mistakes—“to err is human.” Second, a human being is subject to illusion. For instance, the shastras mention that every materially conditioned being is under the illusion that the body is the self. Whatever his position in the world, a person is under illusion if he thinks of himself in terms of nationality, religion, race, or family. (A person’s first step in transcendental knowledge, according to the Vedas, is realizing that his identity is beyond the temporary material body.) Third, every person has limited or imperfect senses. For instance, in a darkened room he cannot see his hand before his face. Finally, the Vedas maintain, everyone has a tendency to cheat. For example, a man who presumes to instruct others although defective himself is actually cheating, because his knowledge is imperfect. Vedic knowledge is shabda, knowledge through hearing from higher authority, and it is therefore considered perfect. The Indian scholar Mysore Hiriyanna writes, “The Vedanta never dispenses with reason, and the Upanishads are themselves full of arguments. All that is questioned is the final validity of reason in matters which do not come within its purview.” To cite a traditional example, if a child wants to know who his father is, he should ask his mother. He may make a survey of the male population, but much more simply, he can ask his mother, the natural authority. In other words, if a person can accept information given by an authority, he does not have to take the trouble to research independently. The shabda method, by which we accept authority, is imperative when we inquire about subject matter beyond the purview of the senses and reason. We may note that in the Vedic conception authority has no Western-styled negative connotations. The term refers not to a dictator but to a deliverer of primary knowledge. For instance, Shakespeare himself is naturally the authority par excellence on the works of William Shakespeare. The Vedic philosophers claim that shabda (hearing from an authority) opens up a realm of knowledge beyond scientific methodology. They hold shabda to be the only process by which we can know what is unknowable in our present conditioned state. To know his father, a child has no other recourse than to ask his mother. This is a matter not of faith, dogma, or feeling, but simply of hearing from one who knows. If a person can learn from someone who has received perfect knowledge, he can get free from all misery. “Just try to learn the truth by approaching a spiritual master,” the Gita (4.34) enjoins. “Inquire from him submissively and render service unto him. The self-realized soul can impart knowledge unto you because he has seen the truth.” In the Vedic tradition, only the person who has “seen the truth” can be the ideal teacher, the guru. In addition, the Mundaka Upanishad (1.2.12) enjoins that a sincere student has to approach the ideal guru to receive transcendental knowledge and enlightenment. The physical setting is the land known to the Western world since ancient times as India, a word borrowed by the Greeks from the Persians, who, because of the difficulty they had with the initial “s” called the great Sindhu River (the modern Indus) the “Hindu.” It was this word that came to be applied by foreigners to the religion and culture of the people who lived in the land watered by the two rivers, the Indus and the Ganges, although the people themselves did not use the term. Of course, “Hindu” and “Hinduism” have come into very wide use, and every dictionary defines Vishnu as “the Hindu god,” although no acharya or scripture ever used the word. “Hindu religion” is also the name applied to describe all kinds of social, cultural, nationalistic, and religious activities, many of which are non-Vedic. To denote genuine Vedic society, the shastras use the word “Aryan.” For the followers of the Vedas, human advancement meant advancing toward spiritual realization, and a community with spiritual goals was known as an Aryan community. The Aryan social institution became known as varnashrama-dharma,which arranges society in eight groupings. We shall now examine Vedic social philosophy in the practical terms of varnashrama-dharma. Everything animate or inanimate within the universe is controlled and owned by the Lord. One should therefore accept only those things necessary for himself, which are set aside as his quota, and one should not accept other things, knowing well to whom they belong. This is the motto of the ishavasya, God-centered, society. Isha refers to the Supreme Absolute Person, Bhagavan. According to this view, the jivas do not own anything. Nor can the community or state assume ownership. As Isha Upanishad explains, nature has designated for each species an allotment ample both for survival and for peace and happiness. By instinct, animals adhere to these natural regulations in their eating, sleeping, mating, and defending, but human beings have the unique propensity to enjoy and possess things beyond their natural allotment. The Vedas direct man to follow the natural regulations. Varnashrama-dharma upholds that by divine arrangement everyone will receive his necessities, and that there will be no scarcity, provided that humanity lives in its natural, sane condition. Houston Smith points out that religions have to become socially active if they are to remain relevant, but that they must not break away from “religion's earlier concerns” if they are to remain religious. According to the conception of ishavasya, found in Isha Upanishad, both material needs and transcendental aspirations find fulfillment in a God-centered society. There was no problem of hunger or unemployment under the rule of the Vedic rajarshis (saintly kings), nor was there heavy industrialization that created artificial needs. The goal of the ishavasya society was not merely peaceful material life but full opportunity for all to attain liberation from samsara. It is only just, in a karmic sense, that an academic scholar be asked to write the foreword for a book that rejects the views of most academic scholars on the historical development of the Vedas. To protect my own academic status (and perhaps incur further bad karma), I should say at the outset that I do not as a scholar accept Satsvarupa dasa Goswami's views on the origin of the Vedas, and I question his use of evidence from the epics and Puranas, which I consider non-Vedic, to prove that these same sources have Vedic authority. At the same time, I recognize that such objections are mere pedantry from the standpoint of the living tradition. Much academic scholarship is like the proverbial medical example: the operation is successful, but the patient dies. Traditions that are healthy never take scholarly diagnoses too seriously, and they stay alive by staying off the operating table. The point of view that runs throughout the work is one best represented textually in the Bhagavad-gita and Bhagavata Purana. The viewpoint is graphically portrayed in a late addition to the Bhagavata Purana, the Bhagavata Mahatmya, where Bhakti (Devotion) is depicted as a young woman with two sons—Jnana (Knowledge) and Vairagya (Freedom-from-desire)—who, incongruously, have grown old and weak and must be nursed back to health by their still young and vigorous mother. Knowledge and Detachment on their own, it is explained, will wither away in this debased age; Devotion alone has the power to restore them to youth and vitality. Transferred to a theory of Vedic knowledge, this position leads directly to the thesis set forth by Satsvarupa dasa Goswami: that the truth and impulse to spiritual discipline of the Vedas are maintained only where they are transformed by the vital power of devotion to the Personal Lord. There is an inherent problem of communicating this viewpoint in the unfamiliar idiom of Sanskrit theological language, but the position is not unfamiliar in the West; indeed, one can argue that the vitality of Western religious traditions has depended no less on a continuing renewal of ancient authority on the basis of new spiritual insights. All Christian churches accept continuing revelation in one form or another, and saints, reformers, popes, theologians, evangelicals and charismatic healers all claim new understanding of the unchanging truth of the Scriptures through the power of the Holy Spirit. Talmudic commentaries, rabbinical interpretations, reform movements and Hassidic mysticism have similarly given new life and meaning to ancient Torah. A religious tradition without saints and mystics, without new revelations, without the experience of the Holy that gives new meaning to ancient teachings—such a tradition, no matter where in the world it may be, is spiritually dead. Satsvarupa dasa Goswami shows us in this book that the Vedic tradition, as transmitted in its dynamic devotional aspect, is in no such danger. Readings in Vedic Literature provides a firsthand experience of India's timeless wisdom. Along with concise introductory essays, the book includes the entire Bhagavad-gita and illuminating excerpts from the Puranas and Upanishads. In this way the reader can discover the tradition for himself.